Image of the Wall of Empathy at the 16th Street BART station in San Francisco. 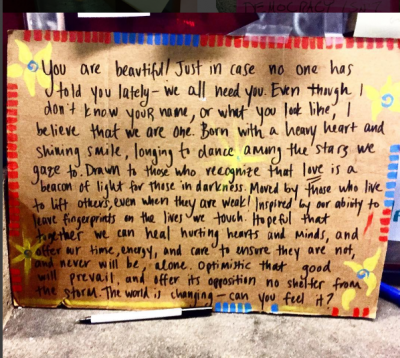 Photo from the Wall of Empathy Facebook event page. 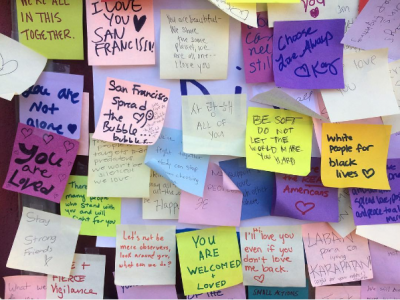 Along with the hundreds of anti-Trump protests across the US, collaborative walls of empathy went up at subway stations in San Francisco to offer group therapy after one of the most divisive and polarizing election seasons in American history. Muriel MacDonald, Tamilla Mir, and Melissa Goldman, the three-women organizing team behind a San Francisco collaborative art project, said they were inspired by a similar “post-it event” in New York, and they decided to name their project the “Wall of Empathy” — partly as a play on words aimed at President-elect Trump's promised wall between the United States and Mexico. San Francisco is one of the most progressive cities in the US and voted overwhelmingly for Hillary Clinton. President-elect Trump only received 10 percent of the vote from this city/county, and his campaign that rode on bigotry, sexism, and racism is unacceptable to many, in the city, as well as Californians throughout the state, where nearly twice as many voters supported Clinton over Trump. 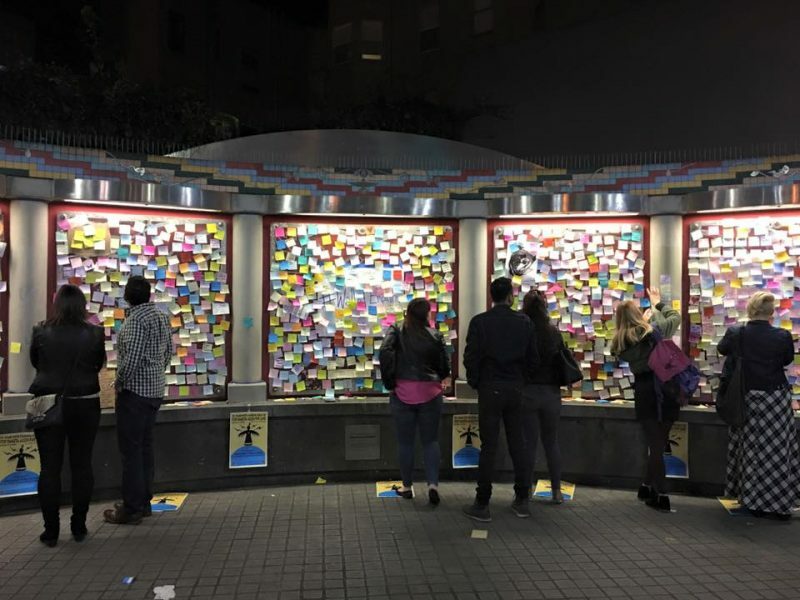 About three thousand people RSVPed for the “Wall of Empathy” event and within 24 hours thousands of colorful post-it messages lined the walls at three San Francisco subway stops. The temporary walls were created at three of the busiest stops in the city: 16th and Mission, 24th and Mission, and Montgomery — two of which are in San Francisco's historic Latino district, the Mission. As soon as commuters would come up the escalators, they would see the post-it walls, markers, and notes. Many got busy reading the notes and some started writing their messages of support. The collective behind the art project is using the hashtag #WallofEmpathy and calling themselves “Dumbledore’s Army” (a reference to the fictional guerrilla group in Harry Potter and the Order of the Phoenix.) and @DAGuerillas on social media. The project started on November 14 and will be live until the evening on November 18, when they will have a closing event of music-making and conversation, before dismantling the temporary art project. “Dumbledore’s Army” hopes to continue creating “radical acts of public art” to counter the “Trump effect.” Global Voices got in touch with one of the group's three organizers, Tamilla Mir, whose interview you can read below. 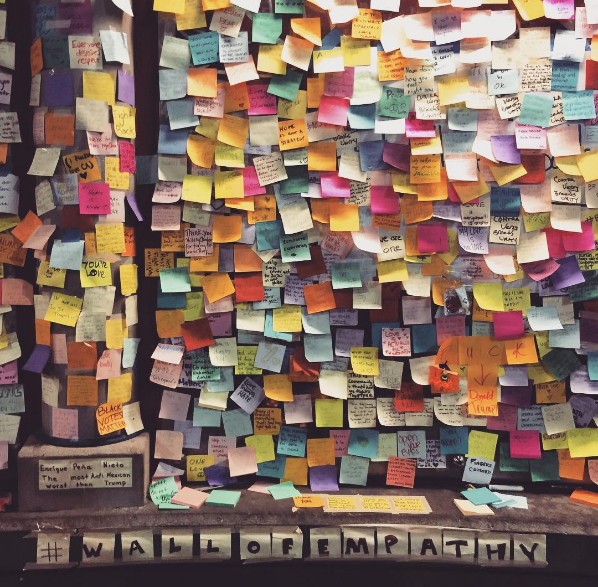 Global Voices (GV): What personally motivated you to organize the Wall of Empathy? Tamilla Mir (TM): I was born behind a wall in a communist country, Azerbaijan. It took two years to reunite with my mother in US. We were not sure what would happen but wanted to search for a better life, the American dream if you will. This past week's election has shook a lot of immigrants and families who've escaped violence and corrupt governments. Empathy ultimately comes from place of pain and loss and that why I wanted to bring the community together and share positive messages that we are not alone and that we can overcome whatever might happen in the next four years. GV: What surprised you about the participation? Did any interactions stand out? Photo by Instagram user @DAGuerilla. GV: Did the wall kickstart any conversations to bridge the divide? TM: I saw a man in a suite sharing a cigarette with a homeless man, they chatted about weed legalization. We had a man interviewed who said he has never cried after an election and has cried twice this week. I spoke to a woman in Spanish who has been in US for 26 years and paid taxes for 20 years and she has hard time explaining to her kids what's happening. This event was very last minute [and] put together [in a hurry] but it was reassuring to see those conversations happen. We want to do a better job bringing people from different community members together in future projects. GV: Tell us about the other organizers. How did you come to collaborate together? TM: My co-organizer Muriel and I have been friends for awhile. We met through mutual friends. We both shared shock and deep sadness after last weeks’ elections. We wanted to do something beyond reading Facebook articles or posting comments on friend's walls. She brought on Melissa, who helped us reach media outlets and organize during the event. We are hoping to continue to use participatory art projects in public spaces to draw attention to pressing issues and bring people together and take action. Close-up shot at 16th Street station by Instagram user oohlulu. GV: San Francisco is one of the most diverse and tolerant cities in the US, how can we help transport that culture across the US? TM: I think San Francisco is diverse and tolerant but we also have issues of losing this diversity due high cost of living. I think we can show that diversity is good and that people working together makes a world a better place, that would be a powerful message to the rest of the country. GV: What advice do you have for people of color, immigrants or members of the LGBTQ community who are struggling to find the capacity to engage with the other side that voted for Trump? TM: I think at some point when you start hating the other side, you no longer see them as people and instead they become an image of an enemy. You stop seeing their struggle and the pain that they are suffering. At that point violence evokes more violence and as Mahatma Gandhi would say “eye for an eye leaves the whole world blind”. That is my worst fear after this election. This is the time to come to together and stand up for America we are all proud of and not just one only benefits the few. GV: Trump's plans for America hit at many of your identities: immigrant, Muslim, woman. What gives you hope? TM: This wall gave me a lot of hope, honestly. Reading hundreds of messages of people who support immigrants, who are accepting of other religions, who encourage to take action. While the country seems pretty divided, I am really excited by how many people are waking up from their daily lives and starting to engage about larger issues.